Per- and polyfluoroalkyl substances (PFAS) are a group of synthetic chemicals known as highly fluorinated chemicals. A subgroup of these chemicals, perfluorinated compounds, or PFCs, contain the most commonly used PFAS in the U.S., perfluorooctanoic acid (PFOA) and perfluorooctane sulfonate (PFOS). These chemicals were used in nonstick papers such as food containers, stain-resistant and water-resistant fabrics, and other consumer products. DuPont’s Teflon cookware coatings and 3M Corporation’s Stainmaster became household staples for decades. Many other companies used PFCs in patented products such as durable plastics and firefighting foams. Firefighting foams used at military bases have been identified as one of the most prolific sources of contamination nationwide. PFAS compounds, released into the environment through air, discharges to land and water, and through products, are spread by stormwater, soil, vegetation, ground and surface water, and are found in fish and wildlife. New Jersey has recently issued fish consumption advisories for PFCs. Sewage sludge called “biosolids” spread on farms have taken the compounds far afield of the original source. Blood studies show the presence of PFAS chemicals in the blood of 96 percent of people in the U.S. Blood studies show the presence of PFAS chemicals in the blood of 96 percent of people in the U.S. They are so widespread in the environment that they have been found in polar bears in the Arctic. Extremely durable, PFOA and PFOS do not biodegrade, so they persist in the environment and build up in the body, accumulating mainly in one’s blood, liver, and kidney. Scientists estimate the levels in an individual’s blood are about 105 times the amount in drinking water. 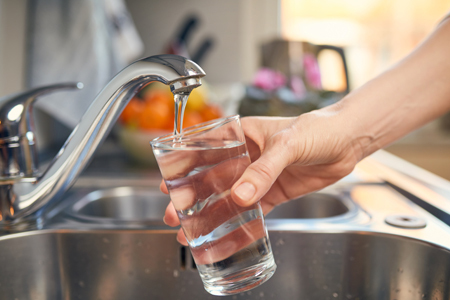 Drinking water is the major pathway of exposure, and since the compounds remain in the body for a long time, drinking even tiny amounts can produce concentrations in blood serum that are higher than the level known to have adverse health effects, increasing the risk of developing diseases linked to these toxic chemicals. Many other studies have been done in recent years of PFAS effects on human health. Significantly, a report reviewing all the studies on low birth weight concluded that PFOA reduces human birth weight, endangering the fetus, infants, and young children — our most vulnerable populations. There is also evidence of PFAS’s connection to high cholesterol, depressed response to vaccines, and decreased fertility in women. Most recently, a study of young men exposed to PFOA and PFOS had “shorter penises, lower sperm counts, lower sperm mobility, and a reduction in ‘anogenital distance,’ a measure that scientists see as a marker of reproductive health.”2,3 Also, studies of the effects on lab animals reveal potential human impacts. Animal studies show liver damage, immune system damage, birth defects, delayed development, and newborn death. PFOA and PFOS caused tumors in rodents. 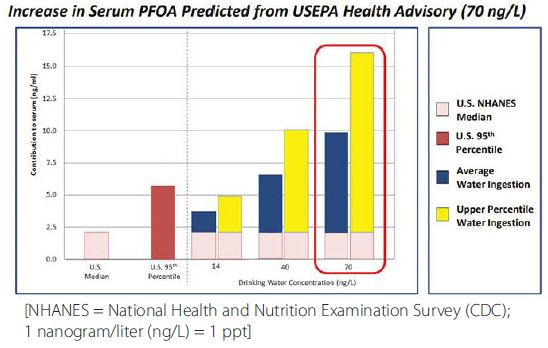 This graphic, published in the scientific literature4 and shared by the New Jersey Drinking Water Quality Institute (DWQI), illustrates predicted increases of five- to eightfold in blood when water is ingested containing 70 parts per trillion (ppt) of PFOA. This is significant because the concentration in the blood increases beyond the level that can be harmful, elevating the risk of disease. This provides evidence that the current U.S. EPA’s Health Advisory Level (HAL) of 70 ppt is not protective of human health. Delaware Riverkeeper Network (DRN) has been working on the problems posed by the presence of perfluorinated compounds in our local environment since 2005 when our staff collected tap water samples in the neighborhoods close to DuPont’s Chambers Works facility in Deepwater, NJ, on the Delaware River. We suspected that there may be a problem because of news reports about attorney Robert Bilott’s lawsuit that had been brought in West Virginia against DuPont for releasing PFOA into the environment there. Our sampling revealed the presence of PFOA in the drinking water being used by people in the local community. We notified the residents and filed the information with New Jersey Department of Environmental Protection (NJDEP), setting off alarm bells and a chain of events. NJDEP investigated the occurrence of perfluorinated compounds throughout the state. When NJDEP conducted its first statewide occurrence study, PFCs were detected in 18 of 23 systems (78 percent) in 2006. High blood levels of PFOA were found in DuPont workers in Deepwater (“Perfluorooctanoic Acid [PFOA] Updated Occupational Serum Sampling, Chambers Works Facility, Deepwater, New Jersey”; submitted to EPA June 4, 2008 by DuPont Corporation). A coalition of organizations formed — environmental groups and the United Steelworkers who represented workers at DuPont Chambers Works facility — in New Jersey to fight for the removal of PFOA from drinking water and the environment and for its regulation by the state. Since then, much more has occurred regarding public knowledge and inquiry into this nationwide problem but, unfortunately, government has been slow to respond, especially at the federal level. In the absence of effective EPA action, states have had to step up to address the water crisis that has resulted because PFAS are still federally unregulated, and people are drinking contaminated water, some of them for decades, but don’t even know it. In 2009, EPA started to take action by setting a federal Provisional Health Advisory level for short-term drinking water exposure for PFOA and PFOS. They also set up a phase-out and reporting program, which led to the major manufacturers ceasing the production of some PFAS by 2015. In 2012, EPA added six PFAS to the list of contaminants to be monitored in a selection of public water systems across the nation.5 This mechanism is how many local water purveyors and the public discovered the presence of these toxic compounds in their water supplies. Outcry from the public in communities where PFAS have been discovered has led to state actions across the nation. Eighteen states have taken some action regarding PFAS, addressing groundwater, drinking water, remediation levels, and effluent limits. Ten states have promulgated regulations, but only one state has adopted a maximum contaminant level (MCL) for a PFAS compound. In 2018, New Jersey adopted an MCL of 0.013 ppt for PFNA, one of the most toxic PFCs, as recommended by the DWQI, the agency charged with this task under the NJ Safe Drinking Water Act. NJDEP is also going to adopt MCLs for PFOA (14 ppt) and PFOS (13 ppt). The PA EQB unanimously accepted the petition in August 2017. DRN filed a letter requesting an MCL no greater than 5 ppt for PFOS in June 2018, citing the need for action on urgent footing. However, the EQB has reported no progress except that the state is attempting to hire a toxicologist. Granular activated carbon (GAC) and reverse osmosis treatment systems successfully remove PFOA and PFOS to nondetect, have been in use throughout the country for many years, and remove many other pollutants as they filter out PFCs, proving multiple benefits. Recent investigative news articles have highlighted the toxic legacy of firefighting foam pollution and are deeply examining DuPont, 3M, and other manufacturers, asking who knew what and when, among other questions. Exposés from several journals and news organizations have shed much-needed light on the long-hidden dangers of these highly toxic compounds that will threaten people and the environment for generations. For instance, three military bases in Horsham, Warminster, and Warrington townships in Bucks and Montgomery counties, PA, are responsible for some of the worst PFOA and PFOS contamination in the nation due to the Department of Defense’s use of firefighting foams impacting drinking water for at least 70,000 people. Subsequent sampling has increased those numbers to include more than 15 municipalities in the region. And PFAS have been found in other places in Bucks and Lehigh counties and Harrisburg, PA, probably from other sources. Pennsylvania Department of Environmental Protection sampling has discovered PFAS at 20 sites across the state, including two near Pittsburgh.9 As a result, Governor Tom Wolf has formed a PFAS Action Team by Executive Order in September 2018. The first public meeting was held Nov. 30, 2018, where various states and agencies made in-depth reports on what they are doing. Notable was the lack of any appointed public or impacted local government representatives who are grappling with PFAS contamination among the Action Team members. Members of the public had 6 minutes each to present their perspectives, expressing frustration over lack of coordinated action; the need for medical monitoring, blood testing, and investigation of local clusters of illnesses; and calling for the state to regulate the compounds and remediate the pollution. And Governor Wolf ’s Action Team doesn’t even mention the EQB or identify establishing MCLs and the mandatory removal of PFAS from drinking water as a goal, begging the question about what “action” they are planning and why they have sidelined the EQB. There is no technical excuse for not mandating complete removal of PFAS immediately. Granular activated carbon (GAC) and reverse osmosis treatment systems successfully remove PFOA and PFOS to nondetect, have been in use throughout the country for many years, and remove many other pollutants as they filter out PFCs, proving multiple benefits. PFAS compounds do not occur naturally. They have been introduced to our drinking water and environment by polluters and will persist unless those who put them there are required to clean up their mess. In the meantime, many people and their families are suffering several of the health effects known to be linked to PFAS, and yet blood testing, health studies, and medical monitoring are scarce, not equitably administered, and vastly underfunded. This is simply not acceptable when those who caused the crisis are the Department of Defense, with its huge budget, and some of the richest corporations in existence. These contaminants must be found, removed from drinking water by mandatory regulation, and the pollution must be cleaned up at the expense of those responsible to ensure our water and environment are safe from these highly toxic compounds so closely correlated to human disease and adverse health effects. This water crisis is a national problem and the urgently needed solution is to restore every person’s right to clean, safe water through mandatory standards and making the polluters accountable. Tracy Carluccio is deputy director of the Delaware Riverkeeper Network (DRN), where she has been an environmental advocate since 1989, working throughout the Delaware River Watershed in Pennsylvania, New Jersey, New York, and Delaware. Carluccio works on many advocacy issues, including water quality and supply, watershed and habitat protection, stormwater management, flooding and flood damage prevention, energy, confronting natural gas development and fracking, municipal planning, community and habitat health, and stream and water resource protection. Carluccio serves as a board member for her municipal Board of Health in East Amwell Township and is a government-appointed member of the New Jersey Highlands Water Protection and Planning Council, which protects over half of New Jersey’s water supplies.